Shakespeare’s Globe theatre has ignored Palestinian appeals and the good counsel of a number of their UK peers by going ahead with their performance of Hamlet at the Cameri Theatre in Tel Aviv on March 30. Showing either ignorance of, or disregard for the highly politicised nature of culture in Israel-Palestine, members of the company justified their action at a press conference, stating, “It was clear to us that we would be coming to Israel, regardless of politics” and “We try not to deal with local politics of the places to which we travel”. As is usual when the Palestinian boycott picket line is crossed by international artists, Israeli media portrayed the Globe’s appearance as a failure for the cultural boycott movement. This English-language news report is a prime example. Statements made at their press conference by actors Keith Bartlett and Jennifer Lang were quoted in a Hebrew language report . Thanks to Ofer Neiman for the following translations into English. Jennifer Lang (playing Ophelia): “We intend for this tour to tell its story to as many people across the world. Any viewer who is not a regular viewer of the Globe is an addition for us. We try not to deal with local politics of the places to which we travel”. 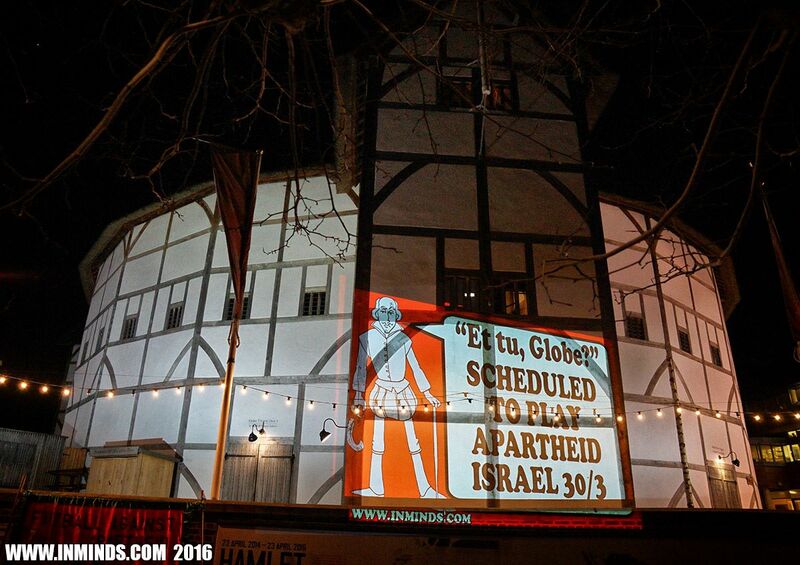 Shakespeare’s Globe theatre has 48 hours to show that it is listening to Palestinians whose call for a boycott of Israeli cultural institutions is unequivocal. One of a series of slogans projected on the Globe theatre by activists at a protest organised by inminds.com on Friday March 25. The prestigious London-based Globe has spent two years on a remarkable project, taking its performance of Hamlet to almost every country in the world. With just days to go before the tour was due to end, a performance at the Cameri Theatre in Tel Aviv appeared on the schedule for Wednesday March 30. Cameri is well known for its performances in the illegal settlements built by Israel on the Palestinian territories its has occupied since 1967. On Friday British theatrical figures, alongside several Palestinian theatre companies, challenged the Globe’s artistic director, Dominic Dromgoole, for breaching the boycott. We reproduce here APUK’s statement, followed by the email from Dominic Dromgoole and the earlier open letter to the Globe. Thank you for responding to our letter. The point we made to you was a specific one. The company in whose theatre you will be performing in Israel has a record of engagement not with the populations oppressed by the Israeli state, but with the illegal settlements which have taken root on the West Bank, and with the army that protects them. It is wonderful that your company presents theatre to refugees living in dire conditions. It would be even better to take steps‎ to eradicate the causes of dispossession and expropriation, as the Palestinian campaign for cultural boycott aims to do. You suggest that there are more important things to worry about than the fact that Israeli theatres play their role in the continuing violation of Palestinian rights. Unsurprisingly Palestinian theatres see things rather differently and have said so. Palestinian civil society has not asked for charity, for free performances nor for special treatment. It has asked for justice, basic rights and an end to violations of international law – which includes violations by theatre companies such as Habima and Cameri. That we must simultaneously fight against our own government’s policies is neither here nor there. If we may speak for our Palestinian partners for a moment, they are dismayed with companies in the ‘west’ who persist in making decisions about engagement with state-funded Israeli organisations, without dialogue with Palestinians. We don’t doubt the commitments that you eloquently express, but there is in this respect, in spite of what you say, an indifference to Palestinian experience and Palestinian views. We remain hopeful that you and your colleagues will reconsider your visit to Cameri. For the sake of clarity regarding the demonstration outside the Globe on Friday, it was organised by another group whose style of protest differs from ours. In this case we can see no evidence of abuse directed at actors, managers or anyone else and we have been happy to use one of the photographs circulated by the group for our blog. Theatre director Peter Brook, in September 2012, declined an invitation to take his company to visit Cameri because, by playing in Ariel, that theatre had ‘accepted to support the brutal action of colonisation’ and therefore ‘in coming to your theatre we would appear as a support for that brutal action’. He acknowledged those artists and other Israelis ‘who share our attitude’ and said ‘it is them we wish to support as well as the people of Palestine’.